I'm linking up with Corkboard Connections for a linky party all about Bloglovin. This party is a great opportunity to get to know some new blogs or at least update your Bloglovin' account. If you notice the new sparkly right hand corner some links to various social networks. The star with the B is my Bloglovin' site. I'm only 2 followers away from 100! My facebook account is only 9 away from 100! and my TpT account just hit 300! Oh happy day! I really appreciate the support and love I've received from y'all. THANK YOU! On to the Bargain of the Day. 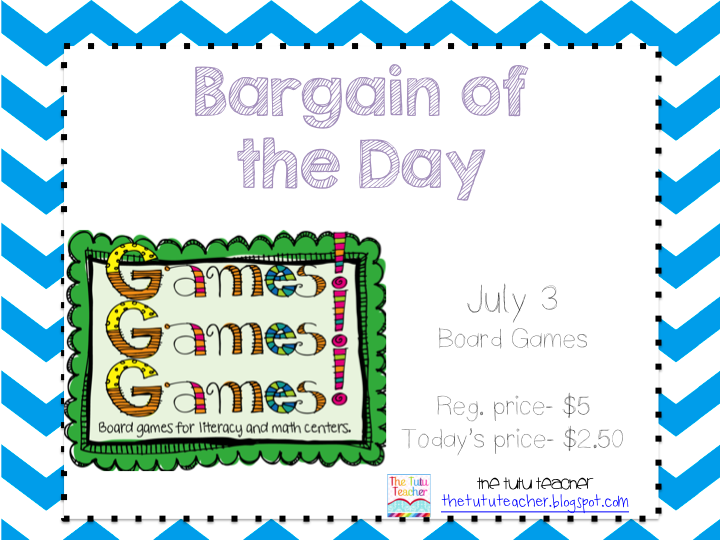 Today's bargain is my packet of board games. Two pages of spinners are included. All games include a color and black and white version. The packet is 27 pages long. I used this mostly with my small groups. It was a great prep or review before we got into the good stuff. Remember tomorrow's a new day and a new bargain!